Molded in white plastic with recessed panel lines, the parts are well done, but fitting them all together takes patience. Optional gear struts and camera parts are given to model XR220, which differed slightly from the other developmental aircraft, and weapons bay options of a nuclear shape or long-range recce tanks are included. Instrument panel and side console decals are provided for the cockpit tub, and two optional seated crew figures are included. The Martin-Baker ejection seats are very plain - I painted seat belts on mine to suggest detail. The cockpit and wheel-well inserts are closed inside the fuselage halves which form a basic core, then the wing and external fairings are added to build up the body outline. Counting the gear doors and intakes, the fuselage exterior comprises seventeen separate pieces. On my sample, none of these parts aligned precisely, and putty and sanding was required to achieve the sleek Mach 2+ silhouette. The one-piece upper wing is well done and correctly contoured. The nice wheel-well detail is visible only if all the separate gear doors are posed open. The clear parts are overly thick with vague window outlines, and the windshield- to-fuselage fit isn't perfect. I opted to pose my model's canopies open to show the interior. The decals are outstanding, and are the best I've ever seen from Airfix; no setting solution was needed, and all markings - even the tiny but complete stenciling - snuggled down beautifully. Three markings options are given: XR219, the only TSR.2 to actually fly (and, sadly, was scrapped) and the two surviving museum aircraft, XR220 and XR222. 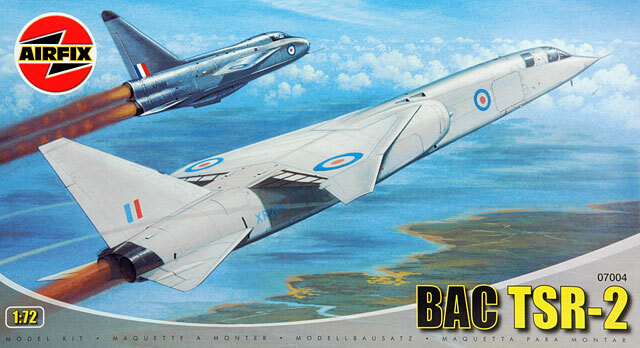 Though shown on the box art, the painting instructions don't note the bare metal sections of the flaps and the metal rub strips on the fuselage at the forward end of the horizontal stabilizers. Using Testors Metalizer and decal strip, I added these details to my model, as well as the long stainless steel strips at the upper forward wing/fuselage joint. I finished my model as XR219 using Gunze Sangyo acrylics. I spent 35 hours on my TSR.2. I was a little disappointed with the fit of this new tool, but boy, it sure is a good-lookin' model. It measures right on the money for 1/72 scale, and it's BIG. Longer than a Lancaster, with the wingspan of a Spitfire and half a Concorde for power, this is one studly machine. Molded in white plastic with recessed panel lines, the parts ..